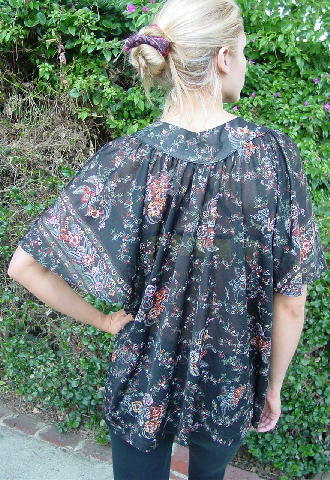 This handcrafted vintage peasant blouse is in a dark olive-forest green with a floral pattern in curry, light powder blue, terracotta, white, black, pink-mauve, and grass green. 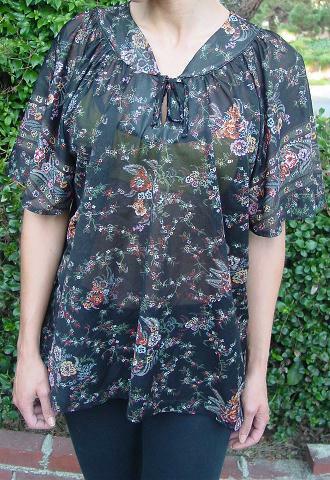 It has wide half sleeves and an angled wide neckline with a faux center bow with a keyhole opening. There is gathering extending downward from the neckline (front and back). It's a sheer synthetic fabric. There are a few snags, but they're hard to see because of the dark color. A model got it from her aunt. It's too big on her. 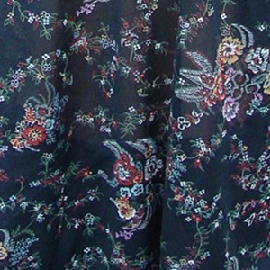 neckline to end of sleeve 15 1/2"